The city’s newest addition to the Ambiente chain is an exploration of the many possibilities of meat. A little man with a very big knife is approaching your table, and he’s got an eager look in his eye. This is what Brazilians call a churasquero: essentially, a waiter wielding a tremendous blade and a skewer full of sizzling meats. At Ambiente Brasileiro, the third edition of one of Prague’s most reputable food chains, a cadre of churasqueros patrol the floor, doling out portions. Just reading the menu here approximates the feeling of drowning in a viscous sea of flesh – which may seize vegetarians with a potent nausea. A glimpse, in no particular order: “piglet, beef rump, angus, chicken hearts, drumsticks, charolais, pork ribs, turkey breast, Uruguay beef, sausages,” and on, and on. Of course, it didn’t require a focus group to figure out that the local market is meat-friendly. But by approximating classic Brazilian culinary and serving style, this newest Ambiente restaurant may well have come up with a winning gimmick. Ambiente Brasileiro’s manager, Michal Chovanetz, laid the groundwork for the restaurant (opened in January) during a visit to Rio last summer. Chovanetz, together with Ambiente owner Tomáš Kartíšek, scoured the Brazilian metropolis for qualified talent willing to make the leap into central Europe. After placing a small want ad in a local paper, they were deluged, says Chovanetz, with “200 phone calls, young people, old people, everyone.” In the end, six were chosen to become the nucleus of the young staff. 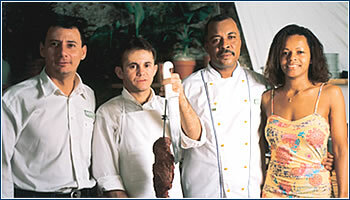 It would be remiss to dwell only on Brasileiro’s meaty aspect. Because though meats do take center stage, there is also a breathtakingly broad fish and salad range, including everything from nigiri sushi to grilled octopus, Italian mozzarella balls and avocado salad. Most impressively, one can order an “all you can eat” starter, fish and salad menu for CZK 185 (while the all you can eat meat offer is CZK 385). And those ambulatory churasqueros also have more than just meat to offer. Other delights to be pulled from their skewers include fried pineapple, grilled veggies, and fried bananas served with garlic mayonnaise. Chovanetz claims that the meats at Brasileiro are never frozen, and that the particular nuances of Uruguay beef (what he cites as the choicest of selections) will immediately distinguish itself from, say, a nice steak at another restaurant down the street – the key being tenderness of the cut. But essential to this restaurant’s finding an immediate appeal, it seems, will not be where the meat comes from, but how it is served. In classic Brazilian style, diners are given a small plastic disc, colored red on one side and green on the other. By placing the disc green-side-up, one is inviting nearby churasqueros to approach bearing more food. Conversely, a red-side-up disc is a plea for respite from the deluge. Depending on the level of your Portuguese and the size of your appetite, the churasquero may very well become much like an additional guest at your table. Though the standardized Ambiente aesthetic can veer dangerously close to shopping mall food court, it is remarkable how well they have taken a crypt-like subterranean interior here and zapped it with a genuine freshness. But the location, nestled in beside Old Town Square, is another matter entirely. For locals native or foreign, this is the demilitarized zone where the ugly anarchy of tourism is the only law of the land. Chovanetz claims that so far, however, his clientele has been largely local. Let’s hope it stays that way. COFFEE DOESN’T get much cooler than this. Three friends have introduced café chic to Vinohrady, with an enticing venue that is part trafika (magazine shop) and part coffee house. What makes this café stand out? 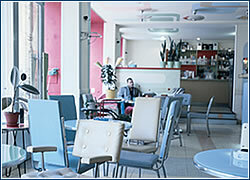 In part, the imported beans used for the various brews; in part, Petra Nováková’s unique interior design, which is complimented with retro-’60s furniture and fixtures; and in part the friendliness of the owners and staff. The atmosphere is already attracting clientele that ranges from the spiffy-suited types and celebrities to more “bohemian” artists and students. If you find yourself above Muzeum in need of a pick-me-up or relaxing time-out, head for Kaaba kavárna. 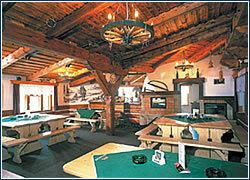 A short distance from Rokytnice nad Jizerou, miles from nowhere, there is a little Bavarian-style chalet in which you will find a pension and a pub. Owner Pavel Hásek rebuilt it ten years ago with the help of a couple of friends, and as the years went by he turned the pension into a place where people come to relax from all over the country. In the winter, families with children come here to ski, and in the summer various events are organized, like antique off-road vehicle meets and rock festivals. The classic pub, with its wooden tables and benches, cannot offer anything but traditional Czech cuisine, including wild game. Even so, local specialties are on the menu here, such as Krkonoše Soup (special garlic soup), smoked and roasted pork joint, or Hejlovský goulash served in a bread bowl. 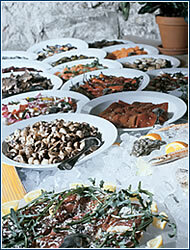 Prices are affordable – CZK 60 for prepared dishes and between CZK 70 and CZK 110 for dishes cooked to order. In nice weather, guests can sit on the outdoor terrace and enjoy a lovely view. 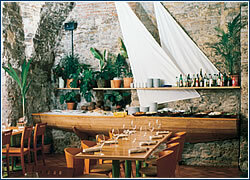 For me, the best restaurant in Prague is Hacienda Mexicana. I love Mexican food and the dishes here are excellent. The service is friendly, and waitresses are taking care of customers – which is very unusual in this town, where it is difficult to find restaurants providing service with a smile. It is not too sophisticated, but rather relaxing; when you enter it is like stepping into a different world. It is suitable for any occasion – many times I have taken clients, we arranged company dinners there, and I also go with my daughter on weekends. My favorites are the beef fajitas and margaritas.